How to Choose Three Color Combos to Make Your Project SHINE! Thank you so much for the massive and awesome reception to the release of the Makariri Shawl last week. If you missed last week’s email or somehow you didn’t get the pattern, click here to download it! With the special Holiday KAL for the Makariri Shawl starting next week, in the Fiber Muse Sanctuary Facebook group, I want to share some tips this week on how to choose color combinations for projects that use three colors. In the pattern itself, I provide some of my favorite color combos, but if you want to step outside your comfort zone and get really creative, let me share some of my favorite resources with you on the blog today! Be prepared to spend HOURS on this site. I LOVE this site. The creator behind the site, Jessica, takes photos and pulls the most common colors from it to create harmonious color combinations, which are fresh, soothing, or just plain gorgeous. She has sorted them by themes, such as the seasons, so if you want to make a Raumati Shawl (Makariri is Maori for Winter, Raumati is summer), you will pull up the summer themes to see what color combos best represent the feeling of summer! Be careful, you can get lost on this site for HOURS! The Great Adobe Color Wheel! If you’re feeling a bit more adventurous, try out the color wheel. 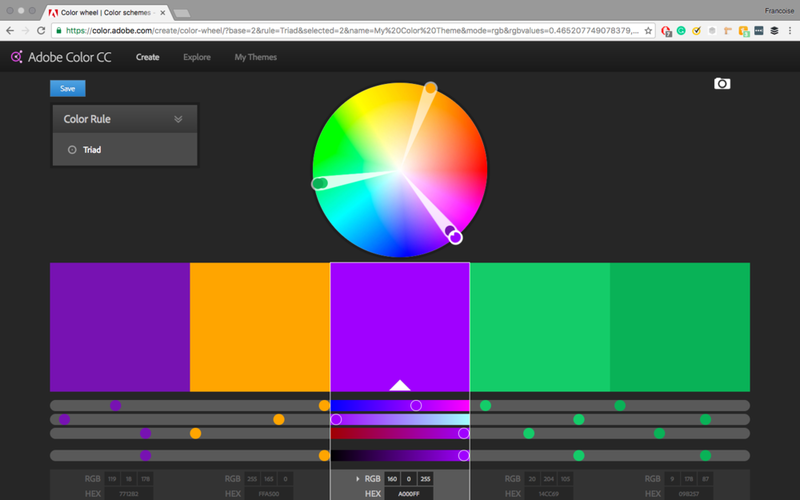 Color theory follows some general rules, and depending on the color scheme you want to follow (such as triad, analogous, monochromatic, etc.) this wheel sets it up so that you just have to play around with the hands, and the colors that pop up will result in a color scheme that will work! Here’s a question for you: based on my original sample of the Makariri Shawl, which color scheme did I follow? Triad, analogous, or monochromatic? Meet Maggie from Assorted Musings! It's been a while since I've updated you all on current happens at Aroha Knits, and I've delayed this piece of news for SO long, so hopefully the wait is worth it. Today I'm presenting a featurette from one of the Aroha Knits partners, Maggie from Assorted Musings. She's a knitter and designer from Austin Texas (my hometown) who sells FOs of her knits on Etsy. She's a licensed seller of my Aura Stole, so once you've read through this interview, why don't you hop by her Etsy shop to take a peak at it? That said, onto the featurette! I live in Austin, Texas and I am a former teacher who had to leave the classroom due to chronic pain. While I was temporarily out of work, I returned to my passion of knitting and began a new passion for designing! My teaching background influences the way I write patterns; I like to make sure my patterns are easy to follow for beginners, as well as challenging for seasoned knitters! I like to focus on fashionable yet functional pieces, and writing patterns that are clear and concise for beginning knitters. I also love recycling yarn to use for projects and to add to my shop for others! What do you hope to spread and share through your products/designs? I hope to encourage others to learn to knit, to try new projects that are challenging for them, and to I hope to teach others techniques that will broaden their knitting style. Sometimes my designs come with tutorials made specifically for the pattern, so newer knitters can feel confident in trying new techniques. It was about a decade ago when I literally dreamt that I was knitting. I had learned as a young child from my grandmother and aunt, but had never fully immersed myself in it as an adult. After my dream I went out and bought a knitting book as well as some yarn, and I taught myself to knit! Over the years I have also taught myself to knit Continental as well as English style, and I taught myself how to crochet. It's a passion of mine to also teach others! Don't compare yourself to others. After almost a decade, I also feel inadequate when looking at others' work! It's important to remember that everyone is on their own journey, both in knitting and in life, and that you bring something unique to all of your projects. I would also suggest joining a knitting group, either online or in person, as knitters are some of the kindest and most supportive people I've ever met! You can find Maggie on Facebook, Instagram, Etsy and Ravelry.